I should be able to keep up some posting here. I’ll see you in earnest on Tuesday. The Roaring Fork Conservancy has launched a study to determine visitor use and spending related to fishing and other recreation-related activities on the lower Fryingpan River and Ruedi Reservoir. “Understanding the river’s economic importance to the local economy will aid in the overall view of the importance of keeping the river healthy,” the Basalt-based conservancy said in a statement. Colorado State University and Colorado Mountain College provided money for the study. The town of Basalt, Eagle County, the Aspen Skiing Co. Environment Foundation and numerous private donors have contributed funding. 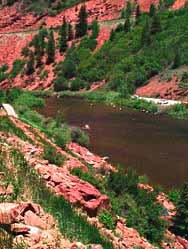 Additionally, the Pitkin County Healthy Rivers and Stream Board made a recommendation to the Board of County Commissioners to fund the study. This new study will echo the work done more than a decade ago by the Roaring Fork Conservancy. Based on the previous study, the Fryingpan Valley’s recreation activities contributed an estimated $1.8 million annually in total economic output to Basalt’s economy. Current numbers are expected to be greater. The conservancy has contracted with Colorado State University to update the previous study. In addition, the conservancy has employed Colorado Mountain College student Christina Briseno to survey anglers and recreationalists. She will be assisted by a recent University of Colorado graduate, Kristjan Danis, this summer. “The results of this Fryingpan Economic Study will be a critical component to the Comprehensive Lower Fryingpan River Assessment where we will gain a better understanding of the users of the Fryingpan River and Ruedi Reservoir, their priorities and influences on local economy,” said Roaring Fork Conservancy Executive Director Rick Lofaro. Results from the assessment will be published in 2015. For updates on the study, visit http://www.roaringfork.org/fryingpanstudy. More Fryingpan River watershed coverage here. A plan is hatching to get pipe in the ground ahead of schedule for the Arkansas Valley Conduit. It would reduce the initial costs of the project and allow some negotiations to proceed even with a reduced amount of federal funding, said Jim Broderick, executive director of the Southeastern Colorado Water Conservancy District, project sponsor. That means Reclamation will be able to begin negotiations with the Pueblo Board of Water Works and Colorado Springs Utilities for use of the joint use pipeline that leads from the south outlet of Pueblo Dam to the Whitlock Treatment Plant. The Pueblo water board owns the pipeline and the treatment plant. Colorado Springs Utilities paid the water board $3.5 million to upsize the pipeline by one foot in diameter, planning to use it for the Southern Delivery System. Since that time, SDS has taken a different route to move water from Lake Pueblo through the north outlet on the dam, and would not need the additional capacity. The pipeline from the south outlet has a total capacity of 248 million gallons per day. Of that, 40 mgd is reserved to serve Comanche power plant and 140 mgd to serve Pueblo. By paying to upsize the pipeline, Colorado Springs reserved 68 mgd, but the conduit would only require 14 mgd, said Terry Book, executive director of the Pueblo water board. 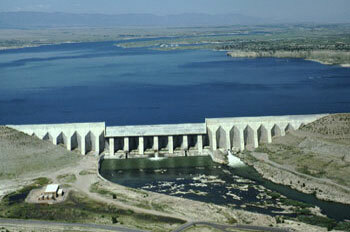 Reclamation also must negotiate with the Pueblo water board for locating a treatment plant at Whitlock to filter water used in the Arkansas Valley Conduit. By moving those discussions ahead, the federal cost will be reduced from $12 million to about $3 million in the coming year, but more funds would be required to begin actual design work, Broderick said. Meanwhile, Colorado lawmakers continue to fight for more federal funding. During a U.S. House committee hearing this week, Rep. Scott Tipton, R-Colo., told Reclamation officials the conduit is a high priority. “The members of the Colorado delegation are committed to the Arkansas Valley Conduit. Reclamation knows that this project offers an effective regional answer to meeting federally mandated Safe Drinking Act standards,” said Tipton.